Open the doors of your room to a retro floral summer! Here are some suggestions to transform it into a colorful and scented garden where you can: listen to some music with a retro radio, follow the rhythm with a romantic guitar and… perhaps get to dance wearing a totally flowery Monnalisa outfit!… Also, why not drink some tea in the garden using a flower printed cup and teapot while we read a wonderful flowery pop-up book! 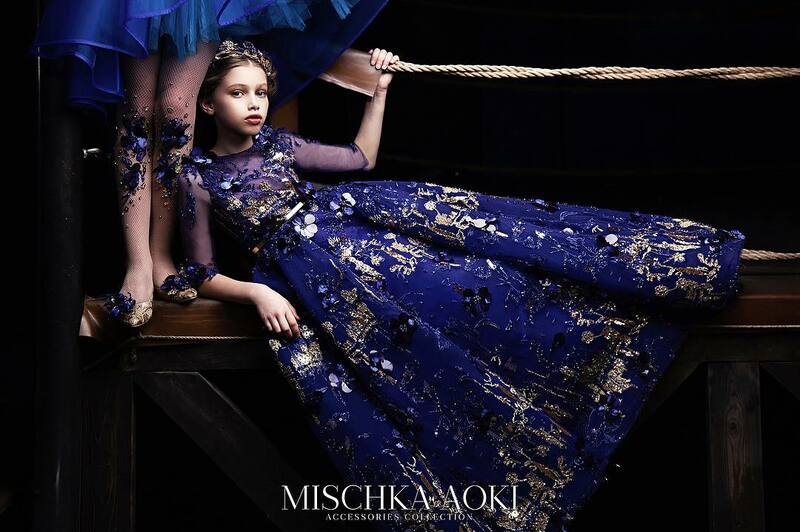 Girls gorgeous dress by Monnalisa Chic made with soft neoprene. 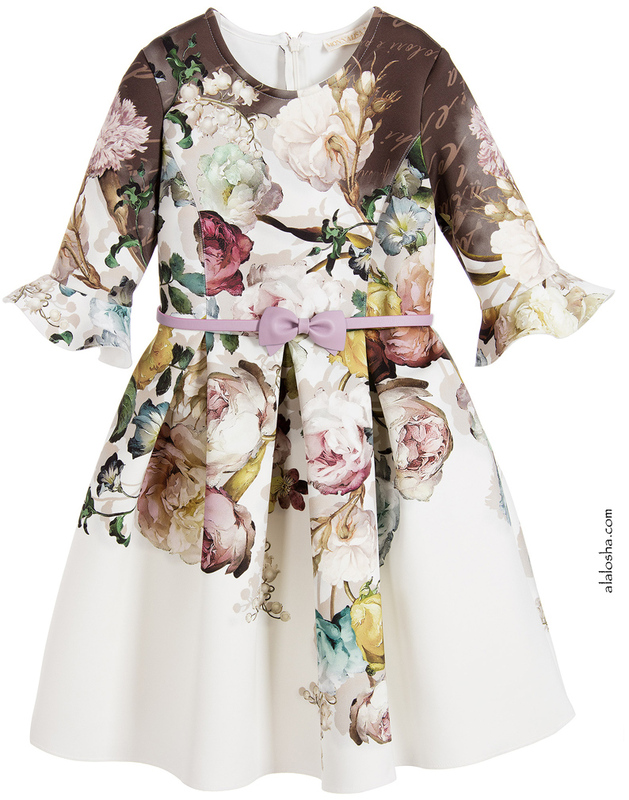 It has a beautiful floral print in muted pinks, greens, and yellows, with brown writing across the shoulders. 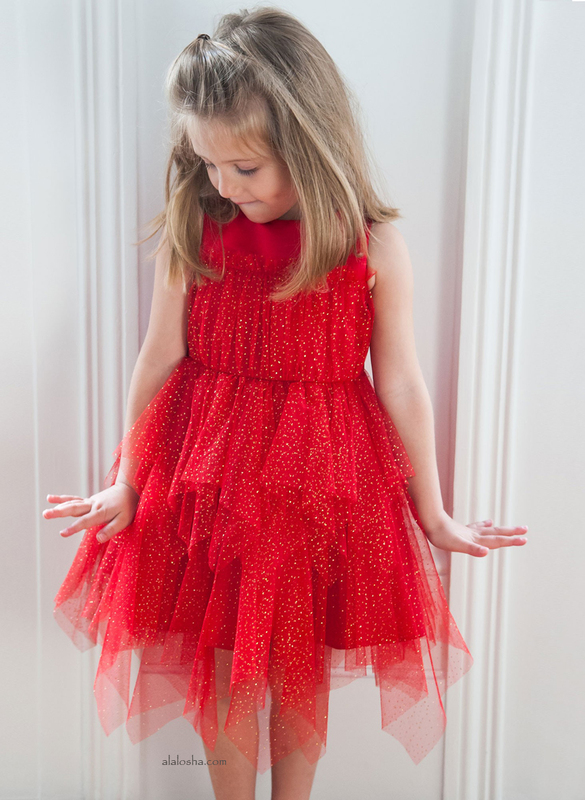 The fitted bodice has three quarter length sleeves with pretty ruffle cuffs and fastens with a zip. 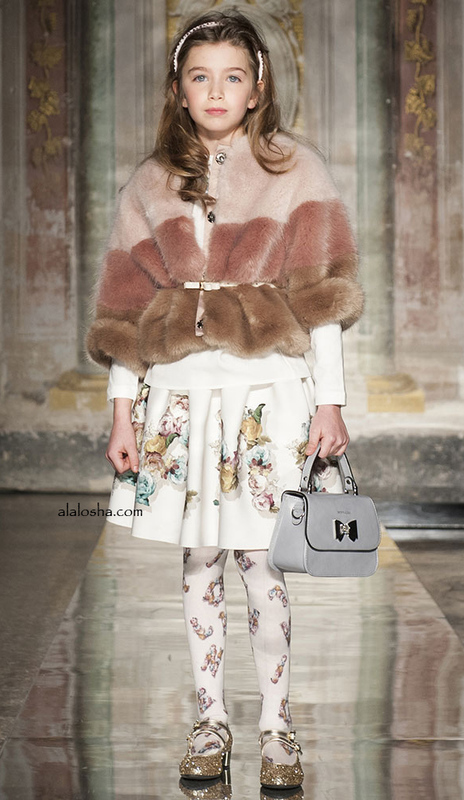 The full skirt has pleats around the waist and there is a pink synthetic leather belt, with a bow to finish. 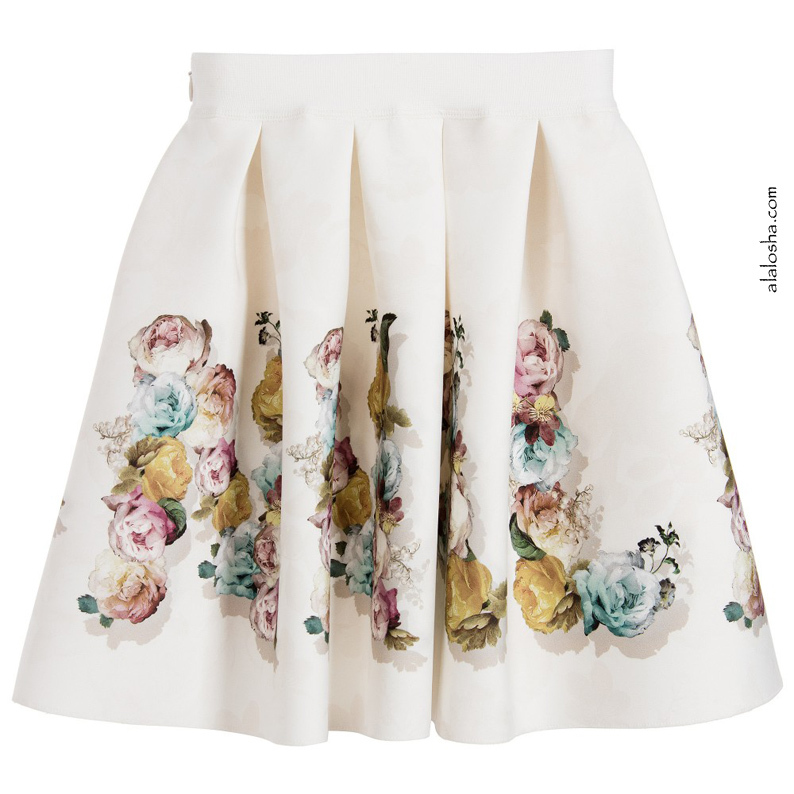 Monnalisa Chic, girls soft neoprene skirt. A flared style with a wide elasticated waistband and pleating around the waist, fastening with a zip at the side. A pretty and comfortable skirt, which would soon become a favorite, with a subtle darker ivory flower print under the beautiful floral print in muted pinks, greens, and yellows. 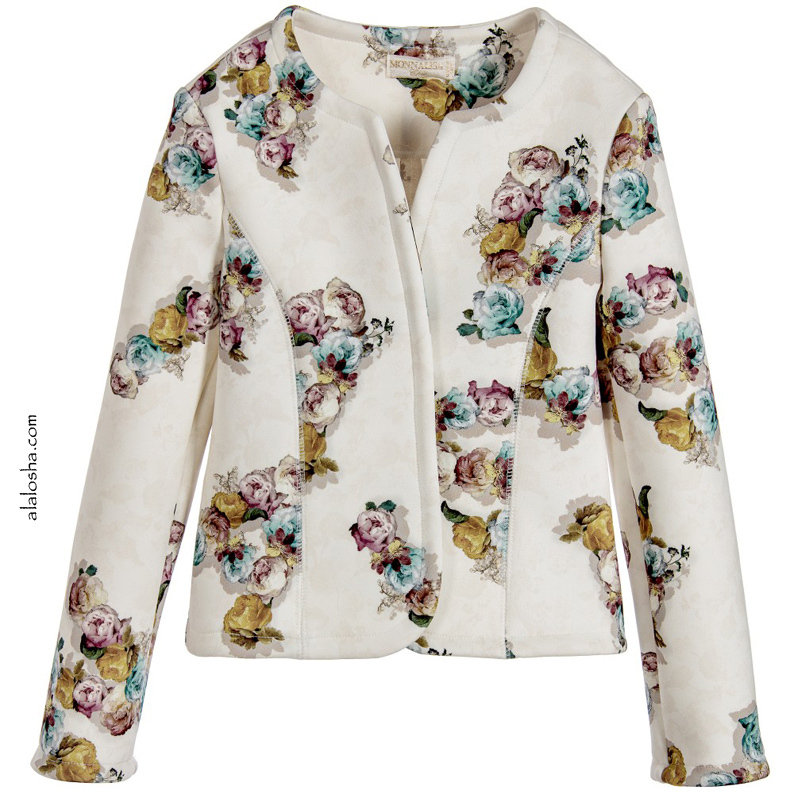 Girls ivory jacket by Monnalisa Chic, with a lovely pink, blue and yellow rose print. Made of lightweight neoprene, it is paneled at the front and back with over-stitching and has a round neck, becoming a 'v' at the front. Closing with a popper at the front, the jacket looks equally good worn with a smart dress or casually with jeans. Girls gorgeous ivory beret style hat by Monnalisa Chic. Made with soft felted wool, It has a pretty flower appliqués in muted tones of green beige and ivory.